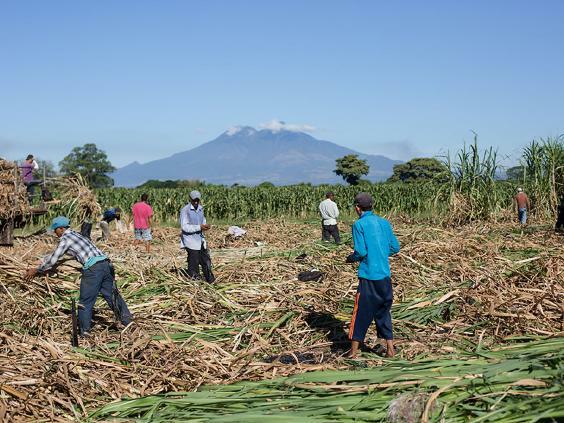 By 10am in the sugarcane fields outside the town of Tierra Blanca in El Salvador, the mercury is already pushing 31C. The workers arrived at dawn: men and women, young and old, wearing thick jeans, long-sleeved shirts and face scarves to prevent being scorched by the sun’s rays. They are moving quickly between rows of cane, bending, reaching, clipping and trimming in preparation for harvesting the crop in the weeks to come. In the scant shade, old Pepsi and Fanta bottles full of water swing from tree branches, untouched. Gulping only the thick air, the workers won’t stop until noon, when their shift is over. Among them is 25-year-old Jesus Linares. His dream, he explains in English, was to be a language teacher, but like many Salvadoran children he went to work to help support his parents and siblings. 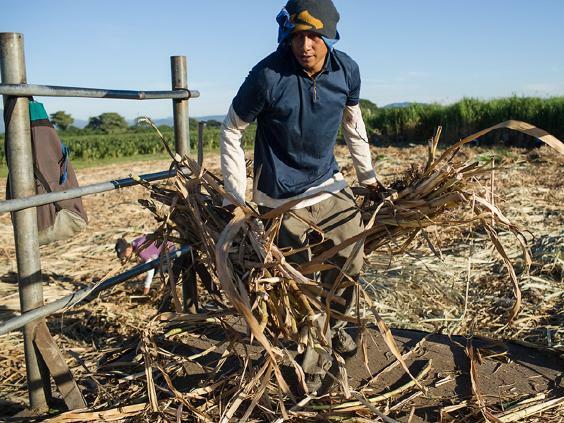 Aged eight, he learned to hide in the towering canes whenever the police sought out underage workers; since then, he’s tended sugarcane from dawn to noon and then pigs until dusk. In the evenings, he tries to listen to English audio programmes or read a language book, but for the last year he’s been too tired to concentrate. So tired, in fact, that a few months ago he visited the Tierra Blanca clinic. Blood tests revealed that Linares was in the early stages of chronic kidney disease. It’s a familiar story here in the Bajo Lempa region, where recent studies suggest that up to 25 per cent of its nearly 20,000 inhabitants have chronic kidney disease. 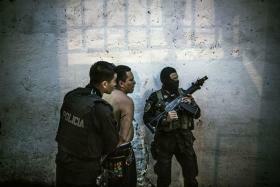 Across El Salvador, kidney failure is the leading cause of hospital deaths in adults. But while chronic kidney disease is most commonly caused by hypertension and diabetes, two-thirds of patients in Bajo Lempa don’t have either of those conditions and the cause of their illness remains uncertain. The patients at the Rosales National Hospital in San Salvador all have the same story: until three months ago they were perfectly fine. Most of them had never seen a doctor in their life before, and had ignored any early signs of ill health this time as well. The turning point came only when they were too sick to work. Working hard lies at the heart of Salvadoran culture. During the 1980–92 civil war, the armed forces carried out a scorched-earth strategy, targeting the civilian population in the countryside to remove any possible support base for the rebels. Tens of thousands died and a quarter of the populace fled. When peace finally came, the rural communities were able to return to their land, which was parcelled out to cooperatives, industry and independent farmers. For the survivors, the only way forward was to work, and work hard, to overcome other challenges that peace could not resolve. 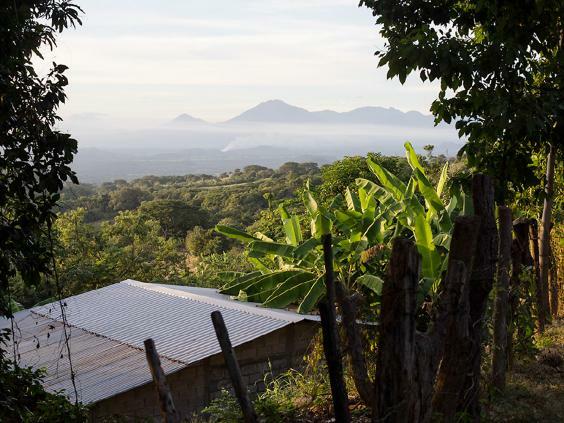 At 8,124 square miles, El Salvador is one of the world’s smallest countries, yet within its boundaries lie endless stretches of coastline, mountain ranges and an abundance of agricultural lowlands, which owe their fertility to rich volcanic soil. There are 23 volcanoes in El Salvador, standing over the cities and central plateaus like guardians. In 2013, people in the San Miguel province fled their homes when the Chaparrastique volcano began spewing hot ash and smoke into the air. Volcanoes aren’t the only natural hazard. The country sits right where the western part of the Caribbean Plate overrides the Cocos Plate, making it one of the most seismologically active regions on earth. In 2001, two earthquakes south-west of San Miguel killed at least 1,000 people and destroyed or damaged nearly 300,000 homes. Such challenges only add to the determination to work hard, and in keeping with this cultural work ethic, many agricultural labourers don’t admit to getting ill, even to themselves. But kidney disease is a sneaky opponent. It can totally destroy one kidney while the individual remains blissfully unaware. Only in the final stages of the disease do the workers get a hint that all is not well, and by the time they arrive at the emergency ward, they are dying. “Sometimes, even with [our] obsolete dialysis techniques, we managed to get some of them to survive a night. A day. A week,” he says. Most died within a month, however, and no one seemed interested in finding out why, or even how many cases there were. So Garcia-Trabanino and a colleague started counting them, one by one, at the door of the emergency ward until, after a few months, their count reached more than 200. 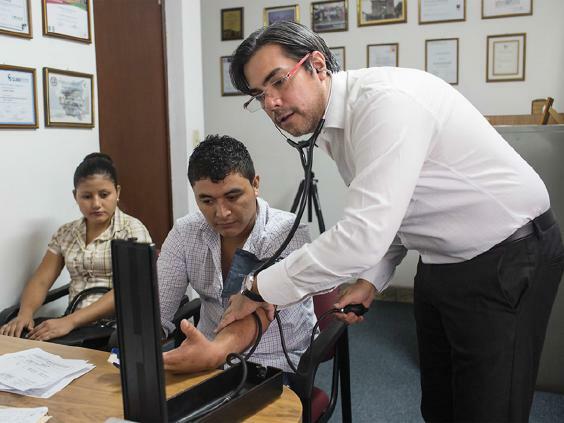 The ministry of health in El Salvador didn’t follow up on their findings, but it did grant the doctors a medal, which garnered media attention. “The next month people from the social organisations of the coastlands came,” Garcia-Trabanino recalls. The visitors told him stories of years of living with unexplained deaths among their otherwise healthy young people. Every other week they had to burn the dead. “You’ve just discovered what we have been living for years,” they said. “Tell me, doctor, what is the cure?” He had no answer. Early in 2016, 32-year-old JosE Luis Morales, a healthy-looking man with a footballer’s physique, began to feel cramps in his legs and became so weak he couldn’t pick up a glass of water. Morales works as a truck driver in Chalatenango, a humid lowland area in northern El Salvador and another hotspot for chronic kidney disease. Unable to work, he went to San Salvador to see Garcia-Trabanino. “He had the classic picture of this disease,” Garcia-Trabanino says. “He is not diabetic, he is not hypertensive. He is young without any past medical history.” Blood tests revealed low potassium and high uric acid levels, which Garcia-Trabanino treated with medication. Currently in stage two of the disease, Morales will need to take medication for the rest of his life. “We can’t revive or bring back to life the lost kidney tissue, but we can take care of what is left,” says Garcia-Trabanino. Chronic kidney disease destroys kidney tissue until it can no longer filter waste from the blood. Without dialysis, this can lead to high blood pressure, weakness, dizziness and a host of other symptoms. But while diabetic kidney disease damages the glomeruli, the tiny units that clean the blood, the new form destroys the renal tubules, where urine is made and transported, and the interstitium, which surrounds the other structures in the kidneys and helps maintain the right balance of fluid. This is the same pattern of damage caused by some toxins, and because the new disease hit the agricultural communities so heavily, Garcia-Trabanino suspected that exposure to herbicides and insecticides might be to blame. 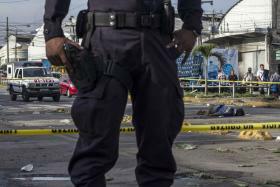 The physicians began to wonder if they were just seeing a local problem, as most of the patients in Rosales hospital had come from the Bajo Lempa region. So Jesus Dominguez, a Spanish volunteer physician in Tierra Blanca, went on a mission. Renting a car and equipment, he drove from Mexico to Nicaragua, stopping by fields and taking urine samples from outdoor labourers toiling under the sun. His study indicated that many of the workers were already in the first stages of chronic kidney disease. Far from being local, says Garcia-Trabanino, “we realised the problem was bigger than we thought, and it was all across Central America and southern Mexico”. Richard J Johnson, a kidney specialist at the University of Colorado, helped organise the World Congress of Nephrology in Canada in 2011. There, he learned about the strange new form of chronic kidney disease spreading through Central America. Researchers from various countries were beginning to get together and discuss the evidence. Like others, Johnson began to think about possible causes. His own research was focused on the sugar fructose – identifying its role in obesity, high blood pressure and heart disease. When a person eats fructose, the liver bears most of the brunt, but some of the sugar eventually ends up in the kidney. With each meal, fructose enters the kidney tubules, where it is metabolised into uric acid and causes oxidative stress, both of which can damage the kidney. 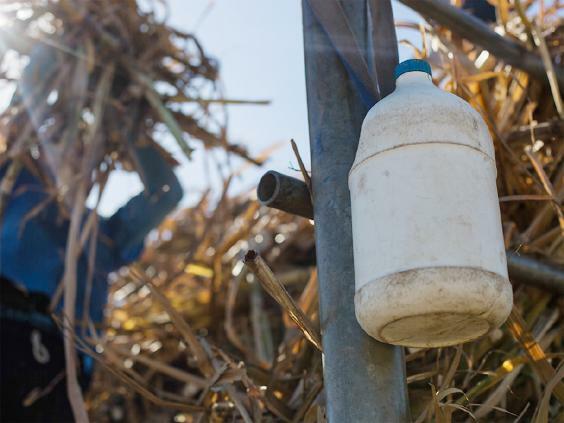 At first, Johnson thought people in the sugarcane fields could be eating so much of the plant itself that they were generating high levels of uric acid and oxidative stress in their kidneys. But, he calculated, even sucking on sugarcane all day wouldn’t produce enough fructose to cause disease. Then he discovered that, under certain conditions, the body processes regular carbohydrates to make its own fructose. And one of the triggers of this deadly alchemy is simple dehydration. Until that point, nephrologists had thought that dehydration could only cause acute kidney injury, but Johnson’s findings put a new spin on the role of insufficient water intake. Could dehydration day in, day out be causing continuous fructose overproduction that, in turn, could be leading to long-term kidney damage? The two collaborated to investigate the biochemical effects of dehydration on workers in the fields of El Salvador. Levels of uric acid started high in the morning and increased throughout the day. “Some patients just had sheets of uric acid crystals in their urine,” Johnson says. From these studies, Johnson believes that heat stress and dehydration drive the production of fructose and vasopressin, which also damages the kidney. However, he believes that another mechanism may also play a part in the epidemic: rehydration with sugary drinks. Frequently, not trusting the quality of local drinking water, workers drink sodas and soft drinks, and experimental evidence suggests that doing so can lead to even more kidney damage. Each month, in the blistering afternoon heat, men sporting cowboy hats or baseball caps and women wearing short frilly aprons over their dresses gather at the Centro Cultural Monsenor Romero in Tierra Blanca. Seated in a shady area next to a garden overgrown with tropical plants, the 40-odd throng hold bottles of water provided for the occasion. On a makeshift table, a volunteer nurse straps the inflatable cuff of a blood pressure monitor on thick arms, skinny arms, arms hardened by years of labour, wrinkled arms softened by old age. Amid the ministrations, raising his voice to drown out the chaos and laughter of children learning traditional dances nearby, Julio Miranda, the imposing leader of the Emergency Social Fund for Health, takes centre stage: “If you want to tell your experience, it will bring benefit to the community,” he says. One by one, men and women stand to tell their stories. As they talk, heads nod in assent, some ask questions. But in true El Salvadoran style, despite the gravity of the accounts, good-humoured jibes prevail alongside the murmurs of empathy. In El Salvador, social security benefits cover health costs for only a quarter of the population. Private, military and teachers’ schemes cover a further 5 per cent, and the ministry of health provides public healthcare to the remaining 70 per cent, according to Garcia-Trabanino. From 2004 to 2013, in this area, 271 patients reached end-stage renal disease, the point at which the only options are dialysis or death. Only a third of them received any type of dialysis, a quarter of these relying on El Salvador’s largest source of income: relatives sending money home from abroad. Of the 235 patients who relied on the public health system, many didn’t have access to dialysis or were afraid of outdated techniques that are associated with a high death toll. Transport costs to and from the city for treatment often proved beyond their means, too. Only 12 of these people were alive one year after diagnosis. But dialysis isn’t the only line of defence if you can act early enough. For Rogelio Sanchez, a bout of gastroenteritis more than 10 years ago indirectly saved his life. Blood tests revealed his kidneys were in the early stages of chronic disease and, since then, medication has stopped the disease from progressing. Sanchez has come to the meeting today with one of his four sons, Henry, a doe-eyed and healthy-looking boy who appears much younger than his 23 years. Five years ago, Henry started to feel sick and blood tests revealed that he also had the new form of chronic kidney disease. Garcia-Trabanino, who is a volunteer physician at the meetings, prescribed a drug to boost his potassium levels, along with potassium and calcium supplements, and advised Henry to seriously reduce his football playing, avoid sun exposure and drink lots of water. Like his father, Henry now has the disease under control. In 2006, the Emergency Social Fund for Health started taking blood samples from all the locals. In 6,000 samplings since, they have found 1,500 people in various stages of the disease. Only 100 have died, and these were workers already in the final stage. For the others, early diagnosis and medication can keep end-stage disease at bay for decades. This requires funding, however. Unsupported by the government, the organisation relies on donations. But in recent years, the number of people who need such treatment has continued to rise. Researchers currently classify the new form of chronic kidney disease as “climate-sensitive”, which means that climate is one ingredient contributing to the epidemic. As temperatures continue to rise, many such climate-sensitive diseases will become climate-driven, and monitoring and bringing attention to them will become even more crucial. “Climate change is not like a new thing, it has been here for a long time,” says Emmanuel Jarquin, who has seen the impacts of rising temperatures on farmers in El Salvador. Already the country has had hotter summers and longer, drier winters. Coffee plantations, usually between 600 and 1,000m above sea level, where ideal cool conditions exist for the crop, have shrunk upwards towards the top of the hillsides. The heat has also increased the number of pests and droughts, and some farmers have begun to swap coffee for cocoa trees. For Garcia-Trabanino, the towering volcanoes have come to symbolise what it means to be El Salvadoran: “I used to think we were stupid people when I was younger, to build under the volcanoes,” he says. “But then I realised they were everywhere.” But living underneath the volcanoes gives people both an appreciation of life – because they can die any day – and a sense of strength.